Azerbaijan is rapidly modernizing and diversifying its economy, increasing its potential in transport, logistics, tourism and agricultural developments across the South Caucasus and Eurasia, and enhancing cooperation with Korea on all fronts, according to the country’s top envoy here. 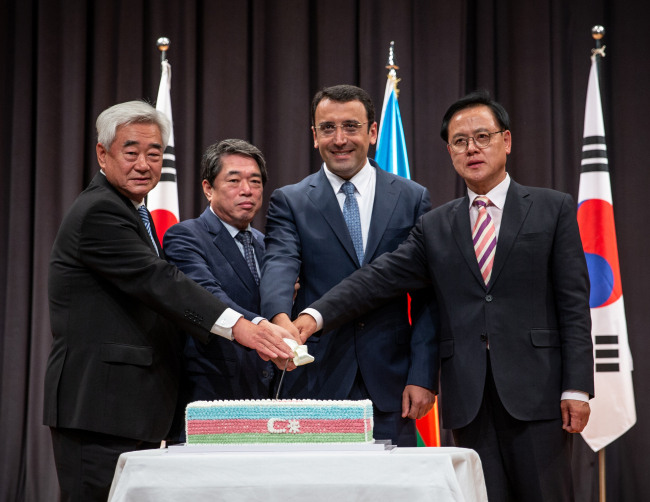 The Azerbaijani Embassy in Korea marked the centenary anniversary of the Azerbaijan Democratic Republic (1918-20), a short-lived nation-state precursor to the modern-day Republic of Azerbaijan, at a National Day reception on May 21. “The Azerbaijan Democratic Republic’s declaration of independence on May 28, 1918, was a historic event and one of the most glorious pages of our history,” Ambassador Ramzi Teymurov said in a speech. The early 20th-century state gave citizenship and political rights to all its residents regardless of their nationality, faith, class or gender. The parliament, which acted as the supreme organ of state authority, gave suffrage to women and gave them equal political rights as men, the first instance for a Muslim-majority nation, according to the diplomat. But the republic did not last long, being incorporated into the Soviet Union in 1920 as the Azerbaijan Soviet Socialist Republic. Baku, the Azeri capital, gained its independence from the Soviet Union on Oct. 18, 1991, hastening the dissolution of the communist empire that eventually ended that December. “Following our independence in 1991, Azerbaijan has achieved dramatic growth in diverse sectors, particularly by implementing mega-projects in energy and transport,” Teymurov stressed, adding the country had embarked on its sustainable development. According to the diplomatic mission, the dependence on oil and gas has decreased and reforms toward a more diversified economy have been put into effect. More than 40 Korean companies operate in the Azeri economy of $64 billion gross domestic product, derived heavily from oil and gas extractions. Azerbaijan is locked in a sovereignty dispute arising from Armenian forces’ occupation of some 20 percent of its territory in the Nagorno-Kharabak region and surrounding areas. The United Nations recognizes the territory as part of Azerbaijan. “Azerbaijan was at the center of the ancient Silk Road. It was a region for trade and cultural exchange between the East and West,” said Moon Duk-ho, Korean ambassador for international security affairs at the Ministry of Foreign Affairs. Noting that Azerbaijan has preserved a brilliant culture throughout its long history, also being the cradle of Zoroastrianism that had a major influence in major religions of the world, he said Azerbaijani and Korean peoples share the same linguistic roots in the Altaic lineage as well as similar family values. The two governments established diplomatic relations in 1992. Parliamentary exchanges between the two countries are vibrant, Moon said, with the speaker of the Azerbaijan National Assembly, Ogtay Asadov, visiting Seoul, and deputy speaker of the Korean National Assembly, Park Joo-sun, visiting Baku last year. Chairman of the Korea-Azerbaijan Parliamentary Friendship Association, Rep. Lee Myoung-su, made an official visit to Azerbaijan in February.